Inverted Dome Pistons 1.5, 1.5, 3.0mm Rings Technical Specs: Bore: 4.040" Stroke: 4.000" Rod Length: 6.123" Compression Height: 1.460"
COATS 1600 Wheel Balancer, Legendary reliability with state of the art capability. SB EDELBROCK VICTOR CYL HEAD HEADERS, 1-7/8" x 2" x 3.5"
(PAT)>> WELCOME TO ENGINE POWER. 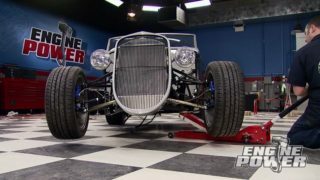 TODAY'S BUILD IS ALL STROKER MOPAR. WE ARE TAKING THEIR 360 INCH SMALL BLOCK ALL THE WAY OUT TO 408 CUBIC INCHES, AND WE'RE GONNA ACCOMPLISH THAT WITH SOME SOLID INTERNALS AND SOME STELLAR FLOWING INDUCTION, AND IT WILL RUN ON PUMP GAS AND CRANK OUT SOME BIG POWER. WE WILL ALSO NEED TO DO SOME CUSTOM MACHINING TO IT TO MAKE IT ALL WORK. NOW NORMALLY WE WOULD HAVE TO SEND THAT OUT TO GET IT DONE BUT NOT ANY MORE. LAST WEEK, JUST BEFORE I FOUND MY RAZOR, WE HAD A SPECIAL DELIVERY HERE IN THE SHOP. MACHINING IS THE CORNERSTONE OF ALMOST EVERY INDUSTRY, AND IN OUR WORLD THE MACHINING NEVER STOPS. 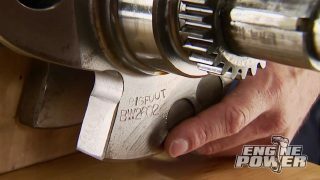 NOW WE'RE ALWAYS MAKING OR FIXING TOOLS AND PARTS FOR OUR PROJECT, AND THIS CAN RANGE FROM JUST SIMPLE BRACKETRY ALL THE WAY UP TO MAKING SPECIALTY FASTENERS. NOW TO GET THIS STUFF DONE IN A TIMELY MANNER WE REALLY NEEDED SOME IN HOUSE CAPABILITIES. THAT'S WHY WE CAN'T BE HAPPIER TO ANNOUNCER OUR PARTNERSHIP WITH MSC INDUSTRIAL. THEY'VE BEEN SUPPORTING THE MACHINING INDUSTRY FOR OVER 75 YEARS AND THEIR BIG BOOK HAS OVER 4,400 PAGES AND WEIGHTS ALMOST 10 POUNDS. THEY OFFER EVERYTHING FROM RAW MATERIALS, SAFETY SUPPLIES, ABRASIVES, MEASURING EQUIPMENT, AND OF COURSE A GIGANTIC SELECTION OF TOOLING AND COMPLETE MILLING AND TURNING MACHINERY. (LARRY)>> SEE OVER HERE IT'S FINE. (PAT)>> JOINING US FOR THE INITIAL SETUP OF THE EQUIPMENT WAS LARRY COSTIGAN AND PERRY MILANESI, WHO PLAY IMPORTANT ROLES AT MSC. PERRY IS THE METAL WORKING BUSINESS MANAGER AND LARRY IS THE MACHINERY CUSTOMER SUPPORT MANAGER. (LARRY)>> WE'RE WORKING WITHIN TENTHS. 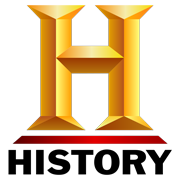 SO IF HUMAN HAIR IS TWO THOUSANDTHS, YOU DIVIDE THAT HUMAN HAIR ABOUT 10 TIMES THEN THAT'S WHAT WE'RE WORKING TO RIGHT NOW. (PAT)>> FIRST UP IS MSC'S VECTRAX 10 BY 54 VARIABLE SPEED MILL. IT HAS A FIVE HORSEPOWER MOTOR, HIGH PRECISION CLASS SEVEN BEARINGS, AND IT'S DYNAMICALLY BALANCED TO BE VIBRATION FREE. ITS RPM RANGE IS FROM 70 TO 3,600, AND THE 10 BY 54 REFERS TO THE WORK TABLE SIZE. IT ALSO HAS A BUILT IN COOLING TANK IN THE BASE FOR OPTIONAL COOLING SYSTEM. NOW ASIDE FROM THE BASIC MACHINE WHAT SPECIAL FEATURES HAVE YOU HOOKED US UP WITH HERE? (LARRY)>> WELL PAT WE HAVE AN AIR POWERED DRILL BAR UP THERE ON THE TOP. COMING DOWN AGAIN WE PUT A QUILL SCALE ON THERE. SO THAT TELLS YOU WHAT THE DEPTH IS. IF YOU WANT TO DRILL A HOLE TO A SPECIFIED DEPTH IT'S GONNA TELL YOU WHAT THAT DEPTH IS. ALSO ONE OF THE KEY FEATURES TO THIS MACHINE IS THE DIAMETER OF THE QUILL. IT'S THREE POINT EIGHT INCHES IN DIAMETER. ALSO WE HAVE A DRO THREE AXIS. WE HAVE AN "X" AXIS, WHICH IS BACK FORTH, "Y" AXIS, WHICH IS IN AND OUT, AND "Z" AXIS IS UP AND DOWN. (PAT)>> NEXT IS MSC'S VECTRAX 1660 HEAVY DUTY PRODUCTION GAP BED LATHE. NOW WHAT A GAP BED LATHE IS, THERE'S A SECTION OF LATHE THAT'S CLOSEST TO THE CHUCK THAT IS ACTUALLY REMOVABLE SO YOU CAN TURN OVERSIZED PARTS, AND IN THIS CASE ONE'S UP TO 26 INCHES IN DIAMETER. NOW THIS BRUTE HAS A SEVEN AND A HALF HORSE MOTOR, PRECISION TIMKEN BEARINGS THROUGHOUT, A NINE INCH THREE JAW CHUCK, AND HAS AN RPM RANGE FROM 36 TO 2,000 RPM. (LARRY)>> THIS LATHE ALSO IS EQUIPPED WITH A TAPER ATTACHMENT. WE PUT A DIGITAL READOUT ON THIS. GREAT, SOLID MACHINE! 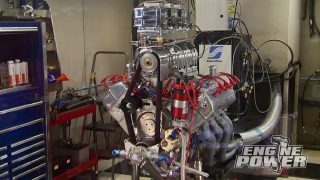 (PERRY)>> MSC'S EXCITED TO BE PART OF THE ENGINE POWER TEAM. WE THINK IT'S A PERFECT FIT WITH OUR BUSINESS AND YOUR VIEWERS, FROM MANUFACTURERS, TO AUTO ENTHUSIASTS, OR HOME HOBBYISTS, WE'VE GOT EVERYTHING THAT THEY NEED. (PAT)>> AND WE HAVE EVERYTHING THAT WE NEED. SO I IMMEDIATELY SET UP AND MILLED THE NEW TOOL POST BASE BLANK TO FIT IN THE LATHE. HAVING THIS AWESOME MACHINERY IN HOUSE IS NOT ONLY CONVENIENT, IT GIVES US TOTAL CONTROL OVER HOW PARTS FIT AND THE ABILITY TO MAKE OR MODIFY THINGS FOR OUR BUILDS. WHEN WE COME BACK WE'RE CONTINUING ON THE STROKER, STAY WITH US. (PAT)>> WELCOME BACK TO THE SHOP. 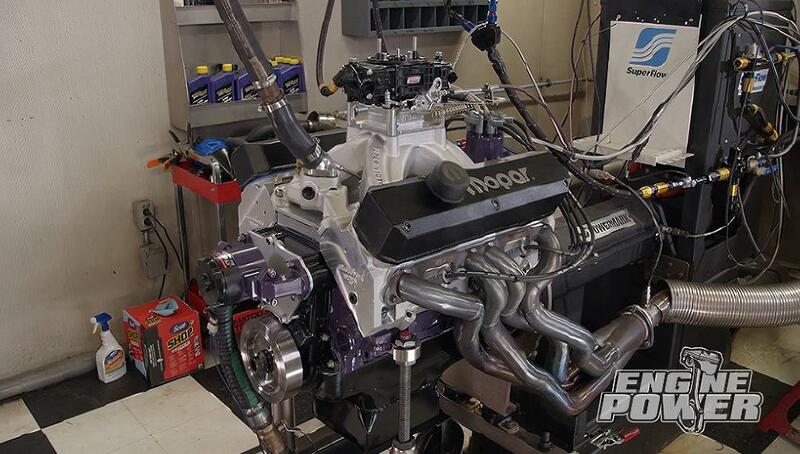 WE ARE WASTING NO TIME IN CONTINUING ON OUR 408 INCH STROKER SMALL BLOCK MOPAR, AND YES, IT IS PLUM PURPLE. WE GAVE IT A COUPLE OF COATS OF DUPLICOLOR'S ENGINE ENAMEL WITH CERAMIC. WHY, WHY NOT? EARLIER WE MOCKED UP THE ASSEMBLY AND THEN MACHINED SOME CLEARANCE NOTCHES AT THE BOTTOMS OF THE CYLINDERS. THIS IS ALMOST ALWAYS NECESSARY WHEN BUILDING A STROKER. THE LONGER THROW PUTS THE SWING OF THE RODS OUT FURTHER, CAUSING BOLT INTERFERENCE. THIS WAS AN EASY TASK TO FIX ON OUR NEW MILL SETUP. IT DOES AN ACCURATE AND PROFESSIONAL JOB MAKING ROOM FOR THE ROD BOLTS. THIS CAN ALSO BE DONE WITH A CARBIDE BURR, A DIE GRINDER, AND A LITTLE PATIENCE, AND THAT'S ALL THAT HAD TO HAPPEN FOR ASSEMBLY TO START. WE STILL HAVE TO DO SOME WORK TO THE HEADS AND VALVETRAIN, BUT THAT COMES LATER. RIGHT NOW WE HAVE TO GET OUR SHORT BLOCK TOGETHER. WE CONTACTED EAGLE SPECIALTY PRODUCTS FOR ONE OF THEIR COMPETITION ROTATING ASSEMBLIES, AND IT INCLUDES ONE OF THEIR SAE 4340 NONTWIST FORGED FOUR INCH STROKE STEEL CRANK SHAFTS THAT HAS BEEN NITRITED, MICRO POLISHED, AND HAS 125 THOUSANDTHS CHAMFERS FOR ADDED STRENGTH. THE CONNECTING RODS ARE MADE OUT OF THE SAME 4340 MATERIAL AND HAVE A SIX-123 CENTER TO CENTER LENGTH. THE SMALL END HAS A HONED BRONZE BUSHING IN IT THAT'S SET UP FOR FLOATING WRIST PINS, AND THE RODS HAVE BEEN ALSO UPGRADED TO AN ARP 2,000 ROD BOLT. MAHLE MOTORSPORTS' POWER PACK PISTONS ARE THE OFFICIAL PISTONS FOR US HERE AT ENGINE POWER AND FOR GOOD REASON. THEY ARE AT THE FOREFRONT OF TECHNOLOGY WHEN IT COMES TO BOTH DESIGN AND MANUFACTURING. THESE ARE MACHINED FROM FORGED 4032 ALLOY FOR LOW EXPANSION. THE SLIPPER SKIRT FORGING ALSO HAS ULTRA STRONG STRUTTED CONSTRUCTION, WHICH REDUCES WEIGHT, AND THE ADVANCED SKIRT DESIGN INCREASE STRENGTH, REDUCES FRICTION, AND ENHANCES DURABILITY. PLUS THEY ARE FULLY PHOSPHATE COATED WITH AN ADDITIONAL GRAFEL COATING ON THE SKIRTS TO REDUCE WEAR, DRAG, AND NOISE. THE RING GROOVES THEMSELVES ARE CUT BY MACHINES THAT ARE ACTUALLY MADE BY MAHLE THEMSELVES TO KEEP IT ULTRA FLAT FOR SUPERIOR SEALING AND INCREASED OIL CONTROL, BOTH WHICH IMPROVE HORSEPOWER. TO ADD TO THAT THE TOP RING GROOVE IS HARD ANODIZED TO PROTECT FROM MICRO WELDING. PROFILED WRIST PIN BORES ALLOW FOR A LIGHTER DESIGN WITHOUT SACRIFICING STRENGTH AND ELIMINATE THE NEED TO HAVE THEM FINISH HONED BEFORE INSTALLATION. COMPLETING THE ASSEMBLY IS THE RING PACK FROM MAHLE, WHICH IS A MODERN ONE POINT FIVE TOP, ONE POINT FIVE SECOND, AND THREE MILLIMETER OIL RING SETUP. ALSO INCLUDED ARE 984 THOUSANDTHS DIAMETER HEAVY DUTY WRIST PINS. 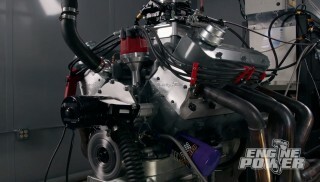 ERSON CAMS HAS BEEN HELPING ENGINE GUYS MAKE BIG POWER SINCE THEY OPENED IN 1964, AND INSIDE THEIR SLICK PACKAGING THEY PROVIDED US WITH A CUSTOM GROUND HYDRAULIC ROLLER THAT HAS 254 DEGREES OF DURATION ON THE INTAKE, 262 ON THE EXHAUST, AND IT'S ON 112 DEGREES OF LOBE SEPARATION. VALVE LIFT FOR BOTH IS 548 THOUSANDTHS WHEN CALCULATED WITH A ONE POINT FIVE RATIO ROCKER ARM. ALSO THEY SENT THE CORRESPONDING HYDRAULIC ROLLER LIFTERS THAT WILL RETRO FIT INTO FLAT TAPPET BASED BLOCKS. FOR THE INDUCTION PRODUCTION OF THIS BUILD WE WENT TO EDELBROCK. THESE ARE THEIR VICTOR SERIES FULLY CNC'ED CYLINDER HEADS FOR CHRYSLER'S SMALL BLOCK LA ENGINE FAMILY. THEY ARE A VERY RACY SETUP WITH A 16 DEGREE VALVE ANGLE AND A 58 CC COMBUSTION CHAMBER. THE VALVES MEASURE IN AT TWO-150 ON THE INTAKE, ONE-600 ON THE EXHAUST. THE INTAKE PORT MEASURES IN AT 225cc, WHILE THE EXHAUST IS 62cc. THE ONEFIVE-50 DIAMETER VALVE SPRING IS ALREADY SETUP FOR A HYDRAULIC ROLLER CAM, AND WHAT'S INTERESTING ARE THESE HEADS FLOW 311 CFM AT ONLY 500 THOUSANDTHS VALVE LIFT, AND THAT MEANS ANYTHING WE WANT TO DO WITH THIS ENGINE IN THE FUTURE THESE HEADS WILL HANDLE ANYTHING WE CAN THROW AT IT. THE MATCHING INTAKE MANIFOLD IS FROM EDELBROCK'S SUPER VICTOR SERIES, AND IT'S SPECIFICALLY ENGINEERED TO WORK WITH OUR CYLINDER HEADS. IT HAS AN OPERATING RANGE FROM 3,500 TO 8,000 RPM, AND IT'S SETUP FOR A 4150 STYLE CARBURETOR. 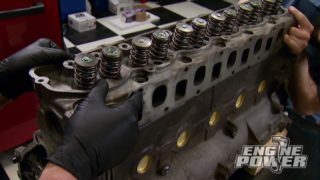 OUR CYLINDER HEADS ARE DESIGNED TO WORK WITH A BIG BLOCK MOPAR ROCKER ARM THAT 150 THOUSANDTHS OFFSET TO CLEAR THE INTAKE PORTS. NOW THEY STILL UTILIZE THE SMALL BLOCK ROCKER SHAFT BUT A BIT OF MACHINE WORK IS GONNA NEED TO BE DONE TO GET EVERYTHING TO ALIGN CORRECTLY. 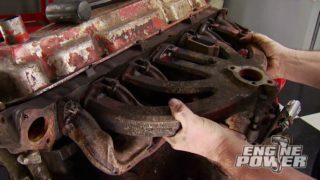 THE SHAFT PEDESTALS HAVE TO BE NARROWED, THE HOLD DOWNS CUT DOWN A BIT, AND THE ROCKER ARM SPACERS HAVE TO BE CUT TO GET PROPER VALVE TIP ALIGNMENT, AND YOU'LL SEE HOW WE GET THAT DONE AFTER THE BREAK. (PAT)>> WE ARE PUTTING OUR SHINNY NEW VERTICAL MILL TO GOOD USE ALREADY. OUR HEADS NEED A LITTLE WORK TO MAKE EVERYTHING FIT UP RIGHT WITH THE ROCKER SYSTEM. TO GET THE CORRECT VALVE TIP TO ROCKERROLLER ALIGNMENT THREE OF THE PEDESTALS HAVE TO BE NARROWED 80 THOUSANDTHS PER SIDE. A THREE QUARTER INCH FOUR FLUTE END MILL MAKES QUICK WORK OF IT. WITH THE VICE MOUNTED BACK ON THE TABLE, I'LL NARROW UP THE SHAFT HOLD DOWNS SO THEY ALLOW THE ROCKER TO BE POSITIONED IN THE RIGHT SPOT. A THREE INCH INDEX END MILL CUTS THEM LIKE BUTTER. THE STOCK BIG BLOCK ROCKER SPACERS NEEDED 160 THOUSANDTHS REMOVED. SO WE'LL SWITCH OVER TO THE LATHE AND CUT THEM TO SIZE. AFTER THE INITIAL SETUP, A DRO MAKES IT VERY EASY TO REPEAT THE SAME SIZE WITH EXTREME ACCURACY. THE ROCKERS ARE NOW RIDING WHERE THEY'RE SUPPOSED TO, IN THE CENTER OF THE VALVE TIP. OUR NEW VECTRAX MACHINERY MADE IT A SNAP TO DO HERE IN HOUSE, AND WITH THE HEADS ALL FIXED UP IT'S TIME TO ASSEMBLE THIS LITTLE BEAST. EARLIER I WENT AHEAD AND SET THE MAIN BEARING CLEARANCES BETWEEN 29 AND 31 TEN THOUSANDTHS. THEN DROPPED IN THE EAGLE FOUR INCH STROKE CRANK AND TORQUED THE MAINS TO 75 POUND FEET WITH EXTREME PRESSURE LUBE. NOW IT'S TIME TO INSTALL THE CUSTOM GROUND ERSON HYDRAULIC ROLLER CAM. TAKE YOUR TIME AND DON'T GOUGE UP THE SOFT CAM BEARINGS. IT SHOULD TURN BY HAND WHEN YOU'RE DONE. 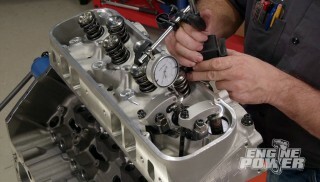 A BILLET TIMING SET FROM SUMMIT IS NEXT. WITH MULTIPLE KEY WAYS, IT WILL ALLOW US TO GET THE CAM DIALED IN WHERE WE WANT. THE ROD BEARING CLEARANCE WAS SET EARLIER AS WELL TO BETWEEN 23 AND 25 TEN THOUSANDTHS. THE MAHLE RINGS WERE FILE FIT AS WELL WITH 20 THOUSANDTHS CLEARANCE FOR THE TOP ONE AND 22 THOUSANDTHS CLEARANCE FOR THE SECOND. WITH THE SKIRTS AND RINGS SLICKED UP, WE'LL USE A TAPERED RING COMPRESSOR AND A PISTON KNOCKER TO SLIDE THE ASSEMBLIES INTO PLACE. TO GET THE PROPER 64 TO 68 TEN THOUSANDTHS BOLT STRETCH THE ARP 2,000 ROD BOLTS HAD TO BE PULLED TO 85 POUND FEET WITH OUR TORQUE WRENCH. WITH THE SHORT BLOCK TOGETHER WE'LL DEGREE THE CAM AND PUT IT IN AT AN INTAKE CENTER LINE OF 108 DEGREES, WHICH IS FOUR DEGREES ADVANCED. (MIKE)>> THE LIFTERS HAVE TO GO IN BEFORE THE HEADS GO ON. COMETIC MLS GASKETS WITH A 40 THOUSANDTHS COMPRESSED THICKNESS ARE LAID IN PLACE. JUST A REMINDER, THIS HEAD HAS A 58cc CHAMBER. WITH THE OTHER COMPONENTS OUR CALCULATED COMPRESSION RATIO IS 10.63 TO ONE, AND YOU GUESSED IT. ARP HEAD STUDS WILL CINCH THEM DOWN. THESE ARE HALF INCH STUDS WITH A 200,000 PSI TENSILE STRENGTH. THAT MEANS WHEN THE FASTENER IS STRETCHED TO ITS BREAKING POINT IT WITHSTANDS FORCES UP TO 200,000 POUNDS PER SQUARE INCH BEFORE FAILING. THEY ARE TORQUED TO 110 POUND FEET WITH ARP'S ULTRA TORQUE LUBE. THE STOCK ALUMINUM FRONT TIMING COVER WAS PRETTIED UP WITH DUPLICOLOR ENGINE ENAMEL WITH CERAMIC IN GLOSS BLACK, AND THEN WE BOLTED IT ON. WRAPPING UP THE BOTTOM END IS A HIGH VOLUME OIL PUMP FROM SUMMIT RACING, ALONG WITH AN EIGHT QUARTER STREET/STRIP OIL PAN. (MIKE)>> WELCOME BACK. I JUST TRACKED OUR PUSH RODS AND THEY'RE ON THE TRUCK OUT FOR DELIVERY. UNTIL THEN WE'RE GONNA GO AHEAD AND GET THE INTAKE MANIFOLD ON. THESE CHINA RAIL SPACERS COME WITH THE CYLINDER HEADS. SILICONE SEALS THEM TO THE BLOCK. THEY ARE DOWELED FOR A POSITIVE LOCATION. NOW THE SUPER VICTOR INTAKE MANIFOLD FROM EDELBROCK GOES ON. DURING MOCK UP WE NOTED HOW WELL THE INTAKE PORTS ALIGNED BETWEEN IT AND THE HEADS. WE MADE IT TO THE DYNO ROOM AND THE ENGINE IS ALL DOCKED UP. TTI PERFORMANCE EXHAUST AND HEADERS SENT US THESE AWESOME LONG TUBES. 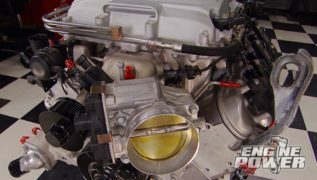 THEY HAVE A THREEEIGHTHS INCH FLANGE THAT IS DESIGNED SPECIFICALLY FOR THE EDELBROCK VICTOR HEAD WITH THE WFIVE BOLT PATTERN. 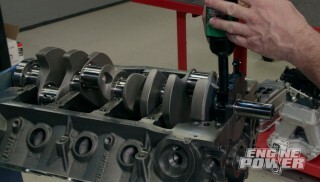 NOW THE PRIMARY TUBES MEASURE AN INCH AND SEVENEIGHTHS, AND STEP UP TO A TWO INCH, MAKING IT A STEPPED HEADER. OUT BACK IS A THREE AND A HALF INCH COLLECTOR, AND ALL THE PRIMARIES WERE MANDREL BENT. (PAT)>> OUR DELIVERY MAN SHOWED UP WITH OUR PUSH RODS. THESE ARE FROM TRENT PERFORMANCE. THEY HAVE 105 THOUSANDTHS WALL THICKNESS, THEY ARE SIX-950 IN LENGTH, FIVESIXTEENTHS DIAMETER, AND THEY HAVE A FIVESIXTEENTHS CUP ON ONE END, FIVESIXTEENTHS BALL ON THE OTHER. NEXT UP OUR IN HOUSE MODIFIED ROCKER ASSEMBLIES CAN GO ON. THE ROCKERS ARE FROM HARLAN SHARP AND THEY'RE A ONE POINT FIVE RATIO. 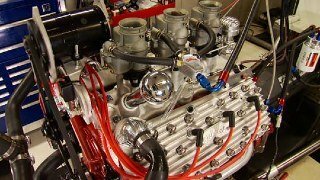 THE ROCKER BODIES THEMSELVES ACTUALLY FIT A BIG BLOCK MOPAR, BUT WERE NECESSARY TO RUN WITH AN EDELBROCK VICTOR SERIES HEAD. MOPAR VALVE COVERS FROM SUMMIT RACING WILL COVER THE ROCKERS. (MIKE)>> IGNITING THE AIR/FUEL MIX IN THE CYLINDER ARE ETHREE 106 RACING SERIES PLUGS. WE'RE RUNNING A LITTLE SHORT ON TIME. SO WE'RE GONNA GO AHEAD AND GET RIGHT TO IT. 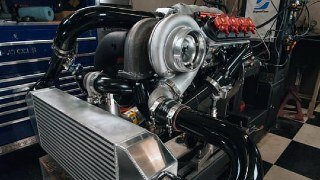 WE'RE RUNNING OUR 950 CFM DYNO CARB, ELECTRIC WATER PUMP, AND 93 OCTANE PUMP GAS. WHEN YOU SEE IT NEXT TIME WE'RE GONNA BE MAKING POWER PULLS. NOW WE'RE RUNNING 93 OCTANE PUMP GAS AND THIS THING HAS 30 DEGREES OF TIMING IN IT. NOW THIS IS A STREET ENGINE AND WE'RE GONNA STEP IT UP DOWN THE ROAD. SO WE'RE THINKING, WHAT, 500 HORSE? (PAT)>> THIS THING BREAKS 500 I'LL BE VERY, VERY HAPPY WITH IT. IT'S GOT A BABY CAM IN IT. SO MAYBE LIFT WISE ANYWAYS. SO YEAH, THINK WE'RE READY TO MAKE A HIT HERE OR WHAT? (PAT)>> NICE, ALL RIGHT, WE'RE ALREADY OVER 500. SO EVERYTHING ELSE IS GRAVY. 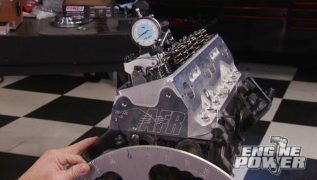 (MIKE)>> PEAK POWER'S AT 5,900, PEAK TORQUE WAS AT 5,000, NICE SMOOTH GRAPH. (PAT)>> THAT WAS AT 30 DEGREES. LET'S STEP UP THE TIMING AND GO FROM THERE. (PAT)>> NICE, I THINK WE MIGHT HAVE SNUCK A LITTLE MORE IN HER RIGHT THERE. (MIKE)>> OH YEAH, SHE REACTED NICE TO TWO DEGREES. 525 ON POWER, 500 POUND FEET. (MIKE)>> NICE LITTLE STREET ENGINE. (PAT)>> I TELL YOU THERE'S A LOT OF POTENTIAL IN IT, AND WE'RE BEING KIND TO IT HERE WITH OUR CAM, AND OUR PULLS, AND ALL THAT STUFF. (MIKE)>> IT'S BEING NICE TO US. LET'S THROW ANOTHER TWO DEGREES AT HER? (PAT)>> THAT'S IT AND THEN WE'LL GO FOR GLORY HERE. OUR FINAL CHANGE IS ADDING ANOTHER TWO DEGREES FOR A TOTAL OF 34. (MIKE)>> LET'S SEE WHAT THE TWO DEGREES OF TIMING WAS WORTH. 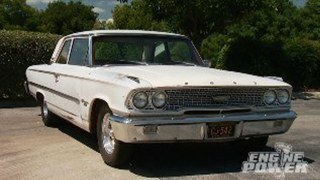 (MIKE)>> ALL RIGHT, GOOD DEAL, 530 HORSE, 503 POUND FEET OF TORQUE. (PAT)>> NICE, NICE, NICE, AND IT HAS A LOT MORE POTENTIAL WITH THE PARTS ARE IN IT. 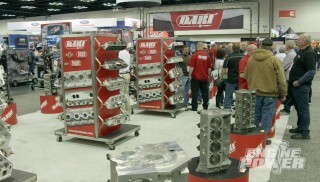 OUR MOPAR FANS, THEY'VE BEEN WANTING A SMALL BLOCK STROKER. 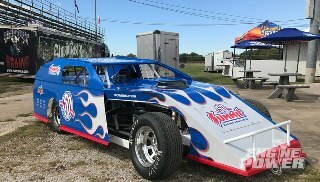 WE GAVE IT TO THEM, NICE PUMP GAS ENGINE WITH A LOT MORE POTENTIAL TO STEP IT UP LATER. (MIKE)>> YEAH, AND WE'RE GONNA DO THAT DOWN THE ROAD. NICE LITTLE ENGINE, GOOD JOB. 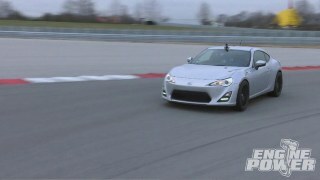 (PAT)>> ...YOU HAVE TO TURN IT HIGHER IN RPM, INCREASE THE CUBIC INCHES, OR A COMBINATION OF BOTH. WITH SUCH A HEALTHY AFTERMARKET NOWADAYS IT'S EASIER TO INCREASE THE SPECIFIC OUTPUT OF YOUR ENGINE NO MATTER WHO YOUR FAVORITE MANUFACTURER IS, AND IT'S JUST NOT LIMITED TO VEIGHTS. FOUR AND SIX CYLINDER GUYS ALSO HAVE STUFF AVAILABLE TO THEM, AND IT'S INTERESTING THAT A BENCH MARK OF 100 HORSEPOWER PER LITER IS WHAT'S TALKED ABOUT IN THE IMPORT SCENE, BUT THAT'S A GREAT NUMBER TO ACHIEVE FOR ANY NATURALLY ASPIRATED POWER PLANT. NOW YOU CAN GET THERE BY USING SOME SORT OF BOOST, BUT GETTING THERE WITHOUT IT, IN MY OPINION, IS MUCH MORE GRATIFYING. VIRTUALLY EVERY PROJECT THAT COMES THROUGH OUR TECH CENTER GETS A WHEEL AND TIRE UPGRADE. SO WE WENT TO COATS SO WE CAN HANDLE ALL OF OUR BALANCING REQUIREMENTS HERE IN HOUSE. THIS IS THEIR MODEL 1,600 WHEEL BALANCER, AND POWERED BY THEIR DIRECT DRIVE SYSTEM, THE MOTOR AND SPINDLE ASSEMBLY ARE PREBALANCED AND ALWAYS STAY CALIBRATED TO ZERO. PLUS THEIR PRO BALANCE TECHNOLOGY MINIMIZED BOTH STATIC AND COUPLE UNBALANCED BY USING A UNIQUE BALANCE ALGORITHM. IT COMES WITH A HEAVY DUTY TOUCH SCREEN THAT YOU CAN ACTUALLY USE WHILE WEARING GLOVES, AND IT WILL HANDLE TIRES UP TO 44 INCHES TALL, AND WHEELS AS BIG AS 30 INCHES IN DIAMETER AND 20 INCHES WIDE, AND FOR MORE INFORMATION ON ALL COATS EQUIPMENT GO TO COATS GARAGE DOT COM. WELL THAT'S ALL THE TIME WE HAVE FOR THIS WEEK. HOPE YOU ENJOYED THE SHOW. AS FOR ME, I'VE GOT SOME NEW TOYS TO PLAY WITH, SEE YOU NEXT TIME!